IA Excellence is one of the leading providers of Cancer Insurance in Canada. It was founded as Excellence in 1963 and as of 1990, it has moved its head office to Montreal, Quebec, still maintaining it’s general mission of providing satisfaction for clients in the insurance industry. It’s cancer insurance plan – Cancer Guard — is one of the most comprehensive cancer insurance plans in Canada and one of the only plans available in Canada that functions like critical illness insurance, but covers types of cancer exclusively. The policy itself is available in three different forms, either as a Term 10, Term 20 or Term to age 75 and is available for ages ranging from one day to 65. Rates stay level for the entire term stated on the policy and are guaranteed renewable, so they can be adjusted upward or downward by the insurance company on a class-wide basis. The policy itself is extremely easy to qualify for. All you need to do is answer “No” to two eligibility questions to do with whether you have AIDS or HIV and whether you have signs, symptoms or are currently waiting on tests to do with having cancer. If you answer both those questions in the negative, you can receive a coverage amount up to $25,000. Then, if you answer “No” to two more eligibility questions to do with immediate family history of cancer and whether you’ve been declined for a critical illness or cancer insurance plan in the past two years, you can be eligible for up to $100,000 in coverage. So if you were to qualify for $100,000 worth of coverage, how much would it actually cost you? If you bought a term 10 plan at $100,000 for coverage and you were a male non-smoker between the ages of 40 and 44, you would pay $45.40 a month. 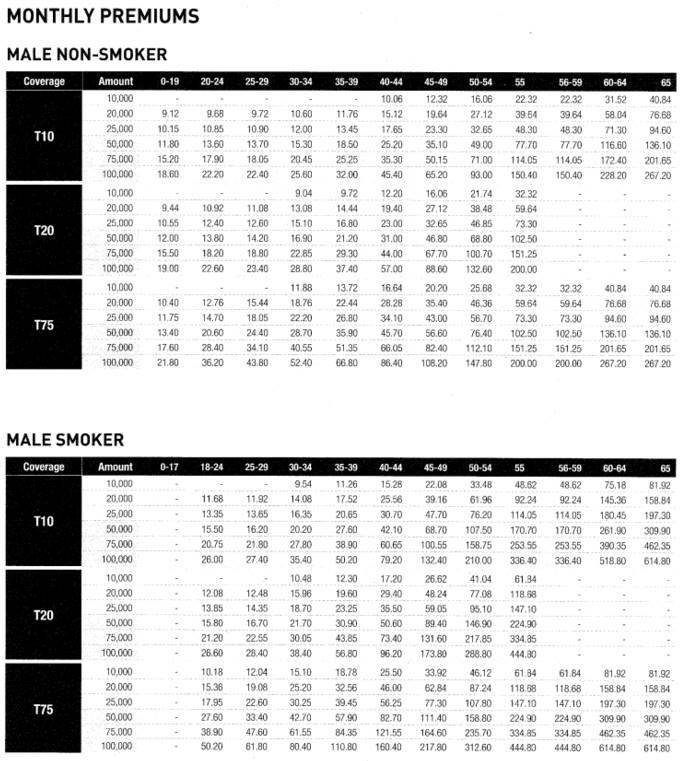 If you were a male smoker, but the rest of the parameters were the same, you would pay $79.20, which is about three times as much. If you bought $100,000 worth of coverage on a Term 20 plan and you were a male non-smoker between the ages of 40 to 44, you would pay $57.00. If the rest of the circumstances were exactly the same, except you were a male smoker, you would pay approximately 50% more at $96.20 a month. Finally, if Term 75 is more your style and you buy $100,000 of that coverage as a 40-year-old, male non-smoker, you can expect to pay $86.40. On the other hand, $100,000 worth of Term 75 coverage for a 40-year-old, male smoker would cost $160.40. This is generally cheaper than the rates you would pay for a traditional critical illness plan, given that cancer insurance only covers cancer and there are no medical tests needed to qualify. Traditional critical illness insurance also typically puts a much higher emphasis on smoking status and health history, so even the smoking rates on IA Excellence’s Cancer Guard cancer insurance plan is cheaper than what can be obtained through a regular critical illness plan. Plus, given that cancer is the leading cause of death in Canada over any other possibilities and the likelihood of being diagnosed with cancer over any other illness is two in five, so if there was ever a worthwhile investment you should make, this should be it. The threshold for acceptance is relatively low and the coverage amount can be yours immediately following diagnosis, so there is no waiting-period as there may be for other plans. The money is delivered as a lump sum all at once and can be used for literally anything you need it for. The possibilities are endless, you can use it for out-patient treatment, to cover your drug costs, as income replacement, or to pay for other services, such as childcare and you are by no means limited to those three options.